Managing Chiltern’s internal and external communications for its acquisition of Theorem, nearly doubling Chiltern’s size and reach. 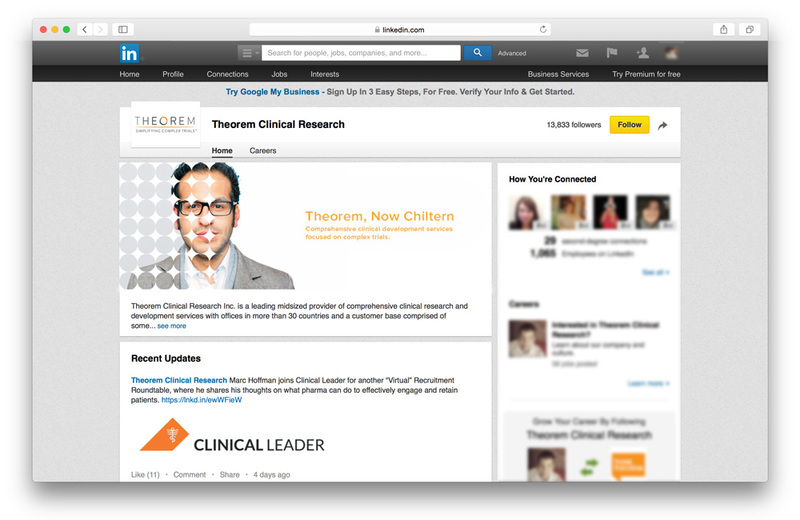 Theorem Clinical Research began its partnership with SCORR Marketing in 2011. 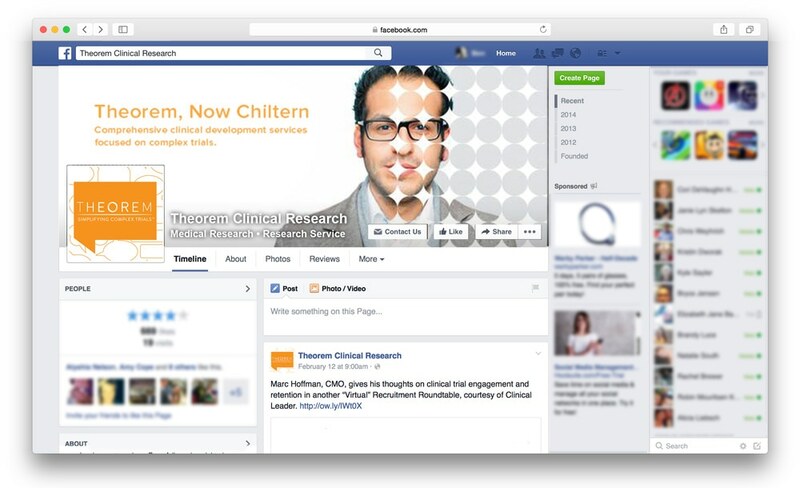 Within four years of this strong and successful partnership, Theorem had more than doubled in size and was recognized as a midsized provider of comprehensive clinical research and development services, attracting the attention of Chiltern as a viable prospect for acquisition. Just days before Chiltern wanted to announce that it had signed a purchase agreement to acquire Theorem, the top leaders of the company approached SCORR seeking help for a smooth transition through internal and external communications. SCORR immediately developed a detailed communications plan and timeline to ensure timely and informative communications with appropriate messaging to all stakeholders. Not only did SCORR ensure that absolute confidentiality was maintained, SCORR also made certain that plans would be deployed at the correct times so that all parties would be notified of the purchase of Theorem at precisely the same time. This work detailed the information that needed to be provided to Chiltern and Theorem stakeholders, including sponsors, internal leadership teams, vendors, current and potential clients, and the more than 3,700 employees between the two companies. It was a conscientious process, requiring plans to make sure that essential players were on the same page, that highly sensitive information would be managed without a single information leak and that all the stakeholders fully understood the benefits that the acquisition would provide. SCORR delivered strategic communications materials to prepare the companies for the day the purchase agreement was announced, including press releases, internal Q&A documents, call scripts and more. SCORR also prepared emails from Jim Esinhart, Chiltern CEO, as well as from John Potthoff, Theorem president and CEO, to notify key leaders and employees of the purchase agreement. Once the purchase agreement was announced and during the competition clearance period before the acquisition was finalized, SCORR acted as the communications expert for both Theorem, a long-standing client, and Chiltern, then a new client. Because strict competition regulations required the two companies to operate separately and competitively during the review period before the acquisition was finalized, SCORR undertook the communications in a similar vein, deploying website banner announcements, social media posts and other communications tools separately for the two companies. At the same time, through comprehensive planning and communications, SCORR managed the conversation in a consultative manner, illustrating the acquisition in a constructive and profitable light. In preparation for the day the acquisition was to be finalized, SCORR developed all the communications materials necessary to ensure Chiltern and Theorem stakeholders would receive the information they needed. For example, employee communications included an introductory email from the Chiltern CEO, along with a Q&A document and an invitation to an all-company meeting. SCORR ensured employees with direct contact with vendors and clients were prepared to answer questions and deliver correct information. Similarly, other communications materials were developed targeting other stakeholders. On Sept. 14, 2015, the day of the public acquisition announcement, SCORR dropped a press release through a national wire service, with targets in North America, Europe, Asia and other relevant media. The press release and a media kit were also sent to SCORR’s proprietary list of editorial contacts. Simultaneously, SCORR updated Chiltern’s and Theorem’s websites with relevant information, graphics and links. SCORR also helped coordinate the delivery of branded gifts — Chiltern pens and cell phone wallets — to every employee in more than 40 locations around the world. In addition, SCORR managed Chiltern’s social media pages to announce the acquisition and merge the companies’ identities. Other materials were delivered to other stakeholders. After the all-company meeting, the SCORR team arranged email deliveries to every employee containing the acquisition PowerPoint presentation, leadership structure material, IT information, social media guidelines and more. In the following weeks, SCORR continued to formulate weekly internal communications to keep employees up to date on the status of the organization while also promoting and celebrating the unification, collaboration and strength of the new combined company. This work included varied tasks, such as offering consultation and communications support to the Chiltern leadership team as it worked out the details of the new management structure, to developing a new website to explain the integrated offerings provided by the enlarged company. 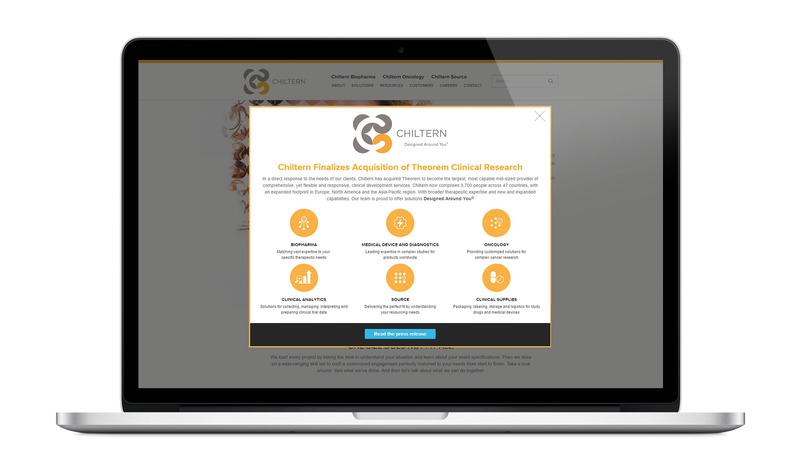 Having grown since the Theorem transaction from 3,700 to 4,300 staff, Chiltern is uniquely positioned as a global CRO with a variety of engagement models using a collaborative approach across 47 countries. Today, SCORR continues to serve as Chiltern’s full-service marketing partner. Share: Managing Chiltern’s internal and external communications for its acquisition of Theorem, nearly doubling Chiltern’s size and reach.